Nice one Bob. Extra crap points for red text on blue. Carp! I guessed CODE “u” and it was 41. Does the sqij towers team award bonus points for submitting a .z80 instead of being arsed to make a .TAP? The snap/tape/disk format doesn’t *usually* affect the scoring – unless it’s sunteam – and then we’ll have a good whinge about it. Personally I like to see a .tap and always load entries without ‘Fast Loading’ turned on to see what pre-game delights are to be had. ITYM that *Lee* will have a good whinge about it. I don’t mind snaps or z80s (although like Myke I prefer the full horror of loading – screen, noises and all), it’s unnecessary .dsk images that require a +3 that really get on my nerves. It’s just such a hassle switching emulated model from the default 48k machine! Oh, and Bob pointed out that I’d forgotten at least one famous Harris – Fred Harris, of Micro Live fame! And I’ve just remembered Wee Willie Harris, who I’ve only ever heard of because of that Ian Dury song. You know the one. 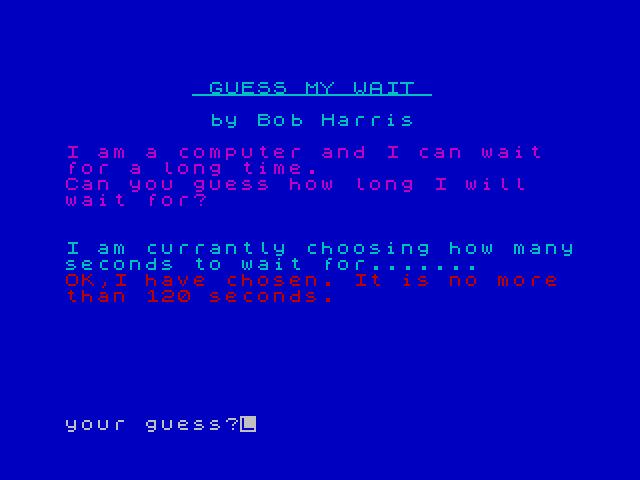 Hmmmm….. on the download page it seems if Simon Ferré wrote this game, but it links to Bob Harris. Alias or typo? It’s a feature. If you apply the correct POKEs this will fix the attic bug and you’ll be able to complete the game.